So one thing that annoys me is when words are redefined or symbols are changed from what they were first intended to be. This is especially true when some person or movement takes something that God has set aside as a reminder of His goodness and covenant promises and flips it on its head into something opposite of what God intended. Me example would be taking the word “Christian” and the symbol of the cross and letting it be used by Westboro Baptist Church. But there is another example that is permitting our society. Please don’t misunderstand me here. If a person or group of people want to have a symbol, they are free to do so in our nation where free speech is protected. But when someone takes something God-ordained and uses it to symbolize that which God calls and abomination, then it is a direct affront to, and a mocking of, God Himself. Read this short passage and try to guess what I am referring to here. The scene is this. The judgment of God has fallen on sinful mankind and everyone has suffered judgment via flood. 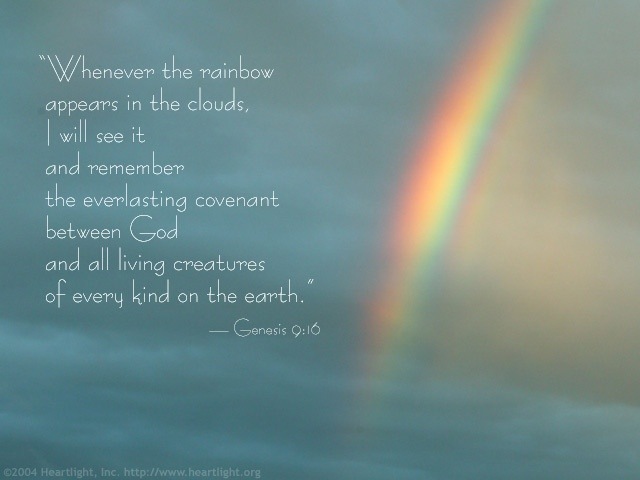 As a symbol of the covenant Jehovah makes with Noah, God designates the rainbow (the first one ever seen) as symbolic of His promise to never again use a worldwide flood to judge sinful mankind. In doing so, it would also be a reminder of the reasons that flood judgment came in the first place. What society is doing now, by making that same rainbow a symbol of the homosexual movement, is to say the following things. 1. Mankind is showing a lack of the fear of The Lord. 2. Mankind is saying that they do not believe that God will judge sin. In fact, they are daring Him to do so. 3. Mankind is saying that we, as fallen, sinful people, have the authority to determine what is good and evil. We have erred in the same way as Adam and Eve when they decided they could define good and evil for themselves. So does that mean we hate people because of who they sleep with? Of course not! It means that I love them enough to warn them of the dangers of mocking God and presumptuously assuming for themselves the authority to decide good and evil. It means I love them enough to tell them that God only wants what is best for them, and that His warnings are not arbitrary, but designed for their protection. But the time has come for us to say “no” to the hijacking of the symbol of God’s covenant. The time has come to tell the world that the rainbow is symbolic of the judgment of God that sin will inevitable bring. But such judgment is not something that any of us must endure, for Jesus Christ has taken upon himself that penalty in our place. Come to Christ in full surrender, submit to His lordship, and escape the wrath to come! Well explained Trail. I don’t expect the folks that abuse the rainbow to understand, unfortunately.